Is it going to be a black tie or white tie affair? Hootie says Mr. K is "crazy cool" in that tie and oh-be-still-my-heart Miss Heather's flower just accentuates her beauty! I'd say Hoot is "right on"! Quite debonair and beautiful, for sure. Socttie Dad has very good taste. They are going to start fashion trends. 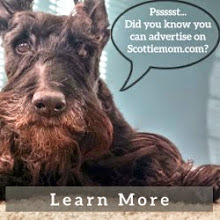 Accessorized Scotties?!? Is there anything cuter than that? Happy WW! Aren't you two just adorable!!!! They are both so stylish! Scottie Dad did a fantastic job! Beautiful!! 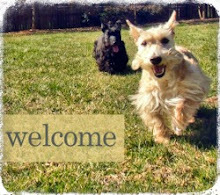 You have got to share your secret for getting your Scotties to take such fabulous pictures! Love them! I wish they made such cute accessories for staffies, Scottie Dad did really well to pick those ones. Love the photos and the outfits, so cute! !